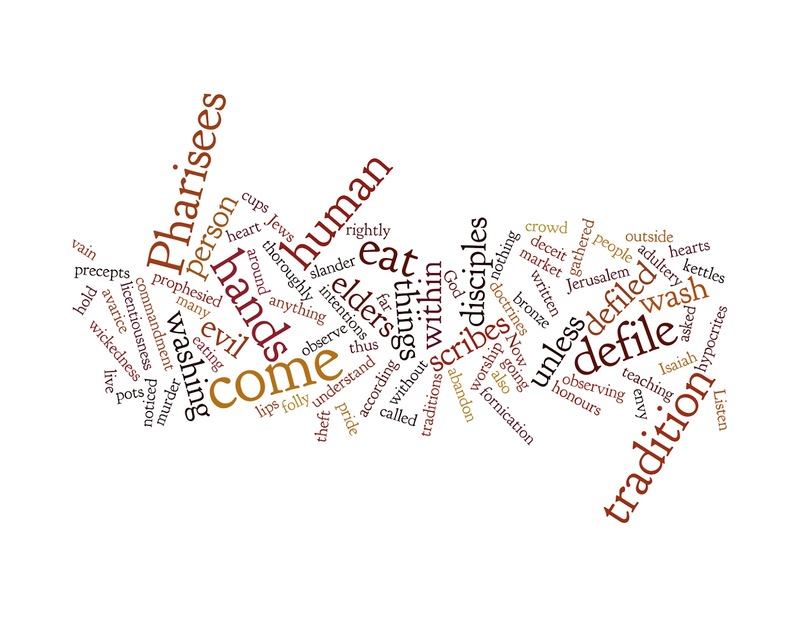 I have not done this for a while, but as I prepare to preach next I thought I would produce a Wordle of the Gospel reading for the day which is Mark 7: 1-8, 14-15, 21-23 which you can read here. The Wordle strkes me. 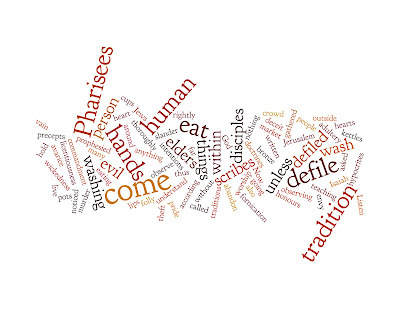 It highlights words of greater frequency in a text and here it has highlighted the words 'Pharisees', 'come', 'hands', 'defile', 'tradition', 'human' and 'eat'. Tradition, ritual if you will, is part of the human experience. We sometimes use the word 'routine', but it's essentially one and the same. We find routine safe and reassuring. It gives us a boundary in which to play out our lives. Our hands are key to our daily living. We use them constantly to express ourselves, to cook, to eat, to defend ourselves and others and so on. They become an outward expression of our inner world. We clench our fist in frustration, we caress someone we love. Our hands can also express aspects of our lives that are very broken. It is no wonder, aside from simple hygine reasons, that washing our hands expresses so much more when used in ritual and tradition. We can wash our hands of someone. A way of letting them go. Leaving them or a bad experience behind. All this is part of what it means to be human. Into the midst of our human experience comes God in Jesus, into the routine and traditions of our lives and those of whom we love. We call this incarnation. But as is so often the case Jesus comes snooping around, asking why, upending our lives and turning over our expectations and experience. And in the midst of it all, almost unnoticed is God, who in Jesus, asks us to reassess what it means to be human, not by our standards or the standards of others, but by the standard he sets for us in his Son Jesus. He does not wash His hands of us, no matter how dirty and defiled ours are. He does not wash His hands of us, no matter how cluttered our lives with little space for Him. He simply reminds us that our hands, our traditions, our lives express to the outside world, our inner thoughts and drives. If we are serious about being clean, about not needing to symbolically wash, but see our lives in a new place, with a fresh start, with an eternal perspective, we simply need to take up His offer to come to Him.